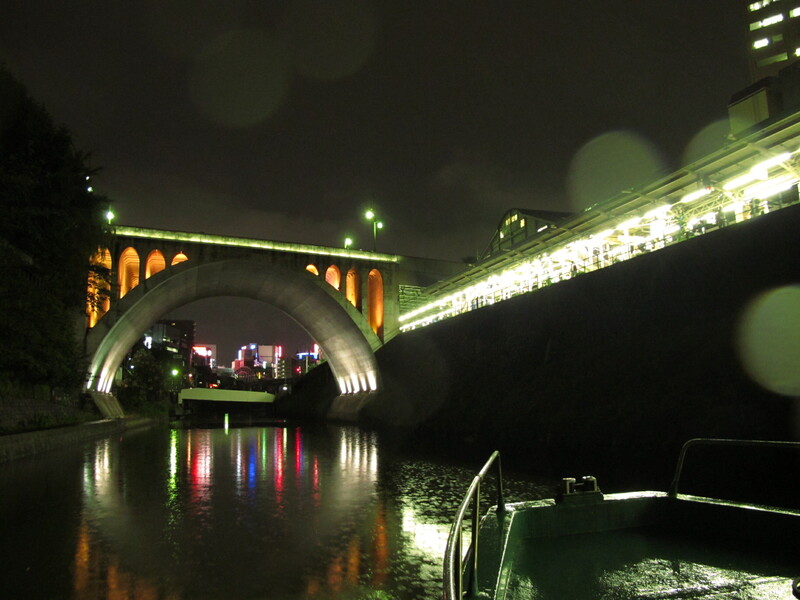 Previously in March 2006 the Lighting Detectives navigated the Nihobashi and Kanda Rivers. 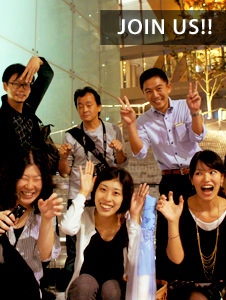 It was such a unique experience leaving the Lighting Detectives wanting more, that we have tweaked the Tokyo river float tour to include the Sumida River and a view of the Rainbow Bridge, for a dramatic 3-hour tour. 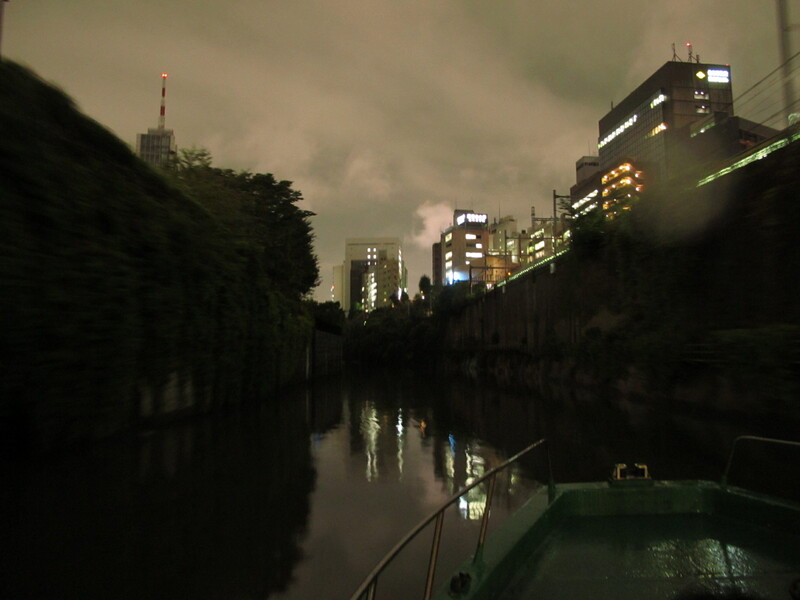 While most of the elevated highway system puts a cap on portions of the center of Tokyo, this creates dark spots with a colorful nightscape in the background, best viewed from, where else, but on the rivers. Lighting under the elevated highway system. 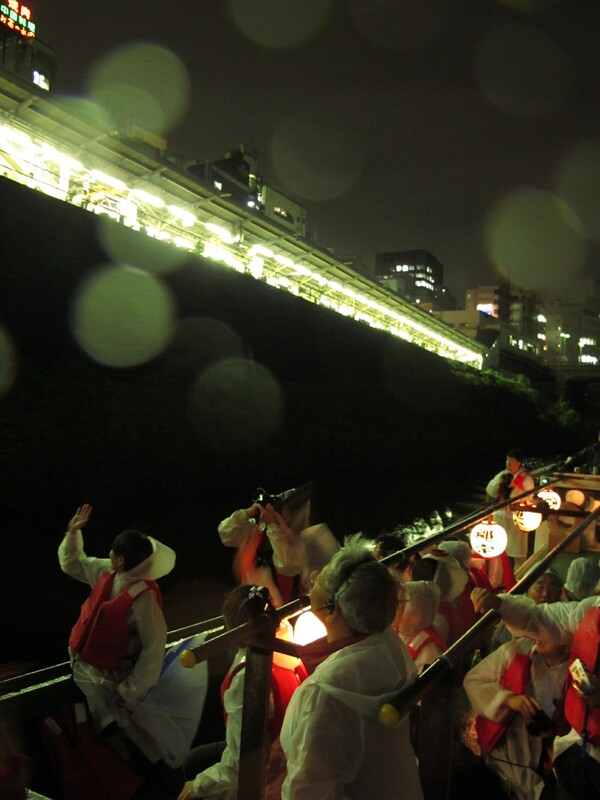 Starting from Hamamatsucho Station, 40 Lighting Detectives boarded a houseboat rented from Nawasada Houseboat Company to navigate the Nihonbashi, Kanda, and Sumida Rivers of Tokyo in the cold and sprinkling rain. 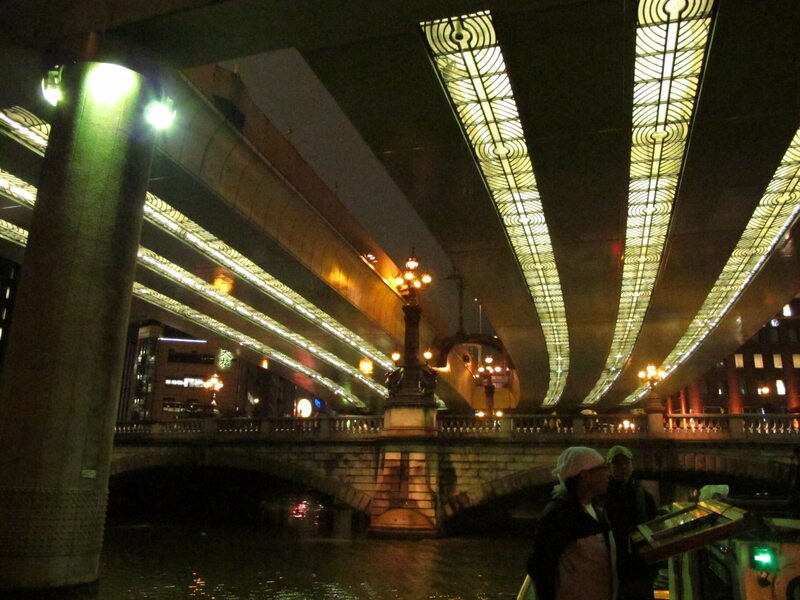 The Nihonbashi River, which is shielded mostly by the elevated highway system, started off the tour. 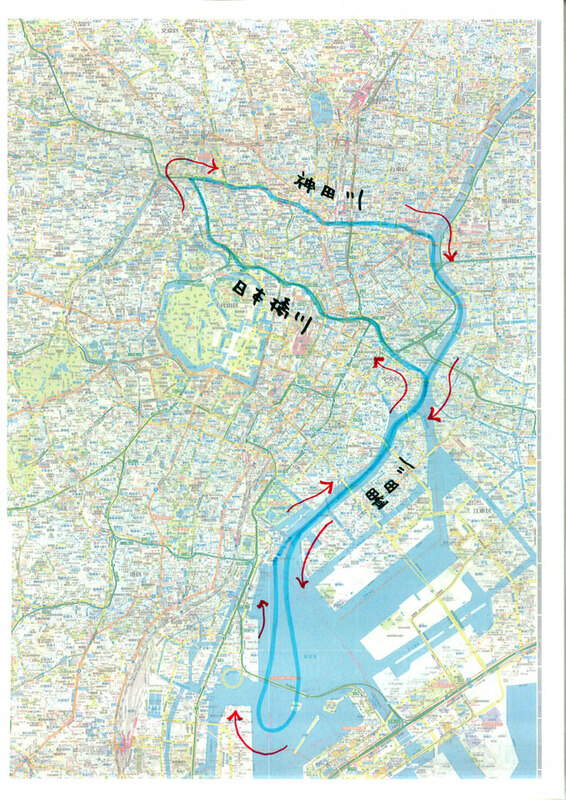 From there, we navigated the more open canal of Kanda River, past Ryogoku Bridge, back to the Sumida River, and headed towards Asakusa. After viewing the Sky Tree, still under construction, the captain made a U-turn floating directly towards Odaiba and the Rainbow Bridge. In spite of the rain and cold weather, tour participants, all decked out in rain ponchos, boarded the boat and continuously snapped photos along the tour route, all seemly enjoying the different perspective of the Tokyo city center. From the Sumida River, under Eitai Bridge, Nihonbashi River takes a curve to the left. The width of the river narrows enormously, as the old townscape of the Edo Period floats by. During the Edo Period this river was central to life; however that scene is all but distant. Now, most buildings have their back to the river and pedestrian traffic is oblivious to the presence of a river. Lighting along the river is also sparse with some fluorescent lighting from office buildings finding its way to the water’s edge. Light from the elevated highway system is only function, at best with no consideration for the view or apparent city planning. 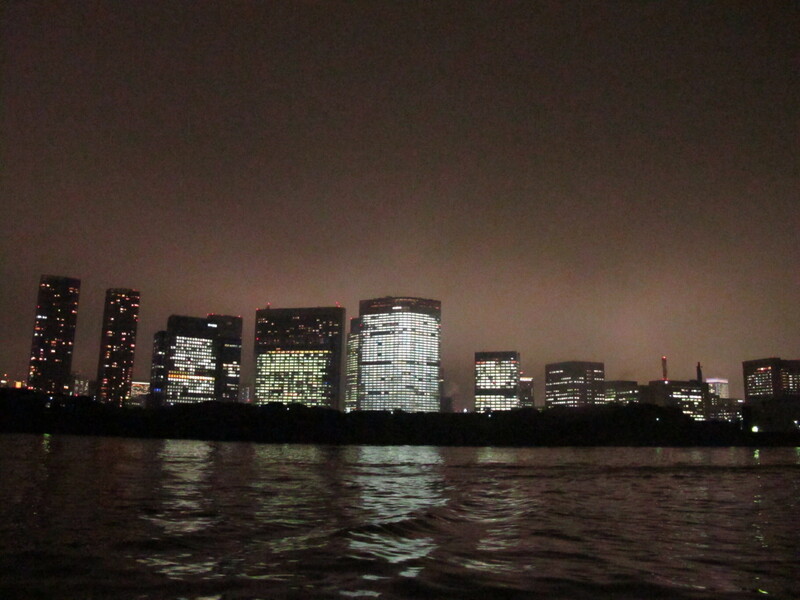 I thought that light from bridges or waterfront cafes shimmering on the water`s surface was a rich asset to a city`s nightscape and a source of relaxation for residents, but this is one area of Tokyo waterfront that is forgotten and forsaken. Along the Kanda River there were three spots with very memorable nightscapes: Ochanomizu, Akihabara, and the Yanagi Bridge at the mouth to Sumida River. 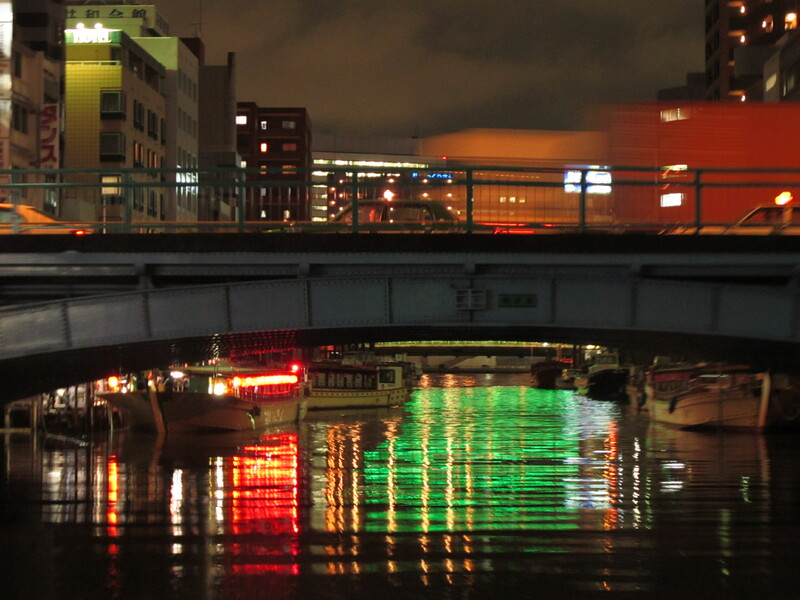 Compared to Nihonbashi River, which is illuminated by roadway lighting from the elevated highway system, Kanda River is relatively dark. In the darkness these three locations along the river proceed with their own unique rendition of light. Ochanomizu seems deep, like a river canyon in the city, with walls of the city rising along the river banks and light from the station platforms shimmer on the water surface. The scene is almost like a stage in a concert hall. On the other hand Akihabara is alive with kinetic light from the electric town. The dynamic facade lighting stretches to the rivers edges with a colorful display on the water surface. 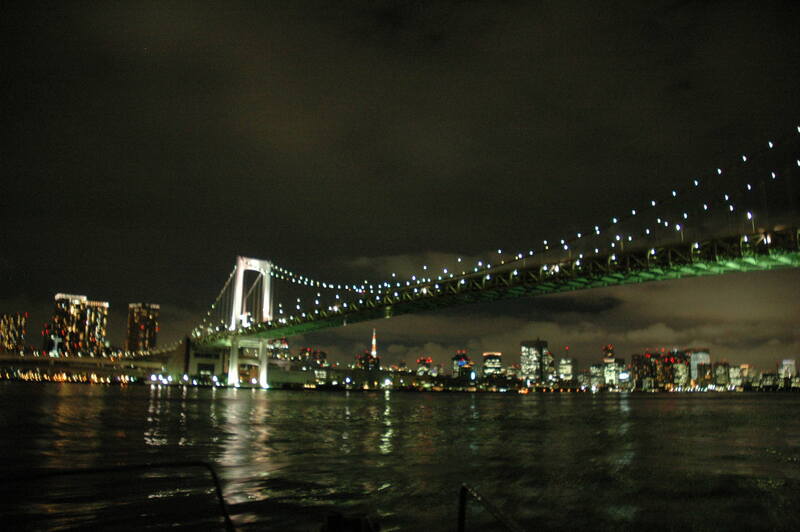 Finally, the Yanagi Bridge is intensely illuminated in green light. From the boat, the illumination is powerful and the shimmering reflection on the water one-of-a-kind, but the fixtures are keenly mounted as not to blind pedestrian traffic. Floating the Nihonbashi and Kanda Rivers, I noticed the most of the buildings do not face the river, but have their back to it. From a pedestrians point of view this isn`t as obvious, but floating on the river gives one a unique view of the city center. The last leg of the tour along the Sumida River towards Odaiba allows an impressive view of the Rainbow Bridge. Floating down river the wide angle view of the Rainbow Bridge includes the surrounding high-rise condominiums, office buildings, and Tokyo Tower for a sweeping view of the Tokyo nightscape. However, the rain and mist along the river kept the bridge hidden until, through the darkness it was a shining beacon of light. Compared to viewing the bridge from a distance, it was a very fantastic picture up close. I realized that to effectively illuminate symbolic architecture it is important to understand the surrounding lighting environment in terms of color, strength, and contrast.